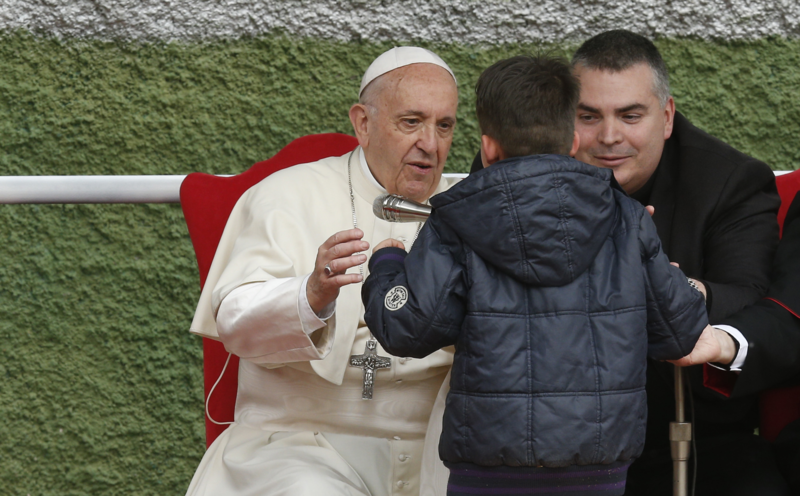 Was Pope Francis right to tell a child his atheist dad may be in heaven? When the monsignor reached out and tenderly held the little boy’s face, I lost it. And it only got worse. When Pope Francis called the reluctant Emanuele up to whisper his question about where his beloved father went after death, I was crying so obviously that the other customers in line at Starbucks looked up from their phones. I muttered a general apology for the public display but continued to watch the rest of the remarkable footage of Pope Francis going pastoral; a good shepherd holding the littlest lamb close to his heart. Emanuele wanted to know: Was his dad in heaven even if he was an unbeliever? Why was I crying? Why had this short clip of an old man being nice to a little boy touched me and many other people so deeply? I think it was because Francis showed us how to risk simply embracing the hurting world. No explaining, just loving. This is love in action, and it speaks to us as words cannot. Francis cuts through the distance between pope and child, between believer and unbeliever, and gets to the heart of the matter—human to human. Francis showed us how to risk simply embracing the hurting world. No explaining, just loving. Francis refuses to be anything other than present to a wounded heart. When Pope Francis says that “God is the one who says who goes to heaven,” he resists placing himself above God or making an idol of our human rules and limited understanding of God. He chooses to act on what he knows of God rather than to limit God by conjecture about the afterlife. Yes, it remains true—according to our best guess and carefully thought out tradition, based on Scripture and enshrined in the Catechism of the Catholic Church—that “those who die in God’s grace and friendship and are perfectly purified, live forever with Christ” (No. 1023). And so this would seem to place Emanuele’s father, an unbeliever, outside the possibility of going to heaven. But “God is the one who says who goes to heaven,” not the catechism. Not the pope, not you or me, but God. Pope Francis refuses to be anything other than present to a wounded heart. It is very hard for Love to be unloving. Are we willing to let God be God? And if we believe God is love, then we can go ahead and believe that God is going to do the right thing. It is very hard for Love to be unloving. Do we know if our loved ones are in heaven? Remember we call them our loved ones not just because we love them but because God loved them first and will continue to love them. So we can continue to trust in God’s love. Sometimes we contrast the technical truth of church teaching with its pastoral application. As though the people of God cannot handle the truth but are best fed with weak platitudes of God’s love. I do not think this is what Pope Francis was doing with young Emanuele. He was not just being nice, that way avoiding telling a little boy the hard truth that his father was not in heaven. It doesn’t work that way. A pastoral response is church teaching articulated in the face of vulnerable humanity. It is teaching distilled to its basic ingredients of love and invitation—the permanent invitation to follow Christ into a radical relationship with the world. And this moves us. We see our leader loving in a way we want to love, being vulnerable and trusting the way we want to trust. And if the pope can resist being the all-knowing God, can’t we give it a try? Can an atheist or someone of non-Catholic faith (e.g., Buddhism, Judaism) lead a life pleasing to God? Can the Holy Spirit love and guide such a person to love their neighbor as themselves without them every embracing a Christian religion or Jesus Christ? If you think that it is possible for non-Catholics to enter heaven upon death, but that the Catholic religion provides its faithful with a surer way to heaven than other non-Catholic religions, then you are living in the 1950s. In this world, significantly more people are born into no religion and non-Catholic religions. Are they all 'disadvantaged' and bear a most difficult journey to heaven than Catholics? Some Christians and Catholics actually think so. I do not. I applaud Pope Francis for not relying on the Catechism or Canon Law to answer this boy's cry for the soul of his father whom he loved. His father may well be in heaven. Michael Barberi your pretty much on points on the action of our beloved Pope Francis, Catechism & Canon Law is needed to govern our faith & behavior...but God is above that, and we cannot limit God Love & Mercy to Man's Finite comprehension on Divine Revelation and Rule of Faith. There's a ministry of contemplatives & victim soul offering reparative prayer that avail much of the mercy of God and we are hoping & praying it can applied to those soul's outside of the True Church established by Christ...It's really in the Hands of a Loving & Merciful God and that's the consoling part.Godbless! What you preach is not Christianity but a vague sort of Universalism. if believing in Christ makes no difference ? admonition from Jesus to preach the Gospel of Salvation. By what authority do you do so and still call yourself a Christian ? Do you know what Francis of Assisi said about "preaching the Gospel"? He said, "Preach the Gospel, but rarely with words." I think folks like you are the sort that would have hauled him and other great saints before the Inquisition. We are told in the Scriptures that salvation is through Jesus Christ alone. As Catholics we know that we have to do works of Charity to and for everyone we meet. Those who are charitable toward their fellow humans are doing God's will. I would not have hauled anyone before the Inquisition, as you seem to have done to me before your own Inquistion. 12At present we see indistinctly, as in a mirror, but then face to face. At present I know partially; then I shall know fully, as I am fully known. 13 So faith, hope, love remain, these three; but the greatest of these is love. Think of all the men and women whose names you already know who were already in the afterlife and had never, ever been a baptised Roman Catholic who were visited by Jesus Christ announcing the joyful tidings of their redemption: Abraham, Moses, David, Noah, Sarah, Deborah and Rebecca as well as the woman at the well and one of the thieves dying on his own cross. If you yourself have had the ambiguous privilege of hearing and believing the good news BY THE SUPERNATURAL GIFT OF FAITH and been baptised and commissioned into the people of God to spread the gospel then the knowledge of sin, judgement, heaven or hell is for you to be concerned about personally. More has been given you, more will be expected. It is between Almighty God and His Son who was obedient to death to do the will of His Father and each individual human being as to their outcome for the rest of eternity. We miserable sinners are to repent ourselves, believe that redemption is ours and hope it will be well for us as promised and then go about spreading the good news remembering that using fear and threats are counterproductive and were used by Jesus only against the elect and powerful. Maybe it's not such a good idea for the church to literally put the fear of God into little kids. The Pope reassured one kid. The rest of the Catholic world's children still believe (with no evidence whatsoever) that God is real and non-believers spend eternity in a lake of fire. This child has shown what an abusive and harmful philosophy Christianity is. "Love me back or I'll set you on fire" is the sort of ultimatum a mafia don issues - it's not the sort of ultimatum that any healthy religion should be issuing. If Christianity is to survive, it must evolve beyond ancient threats of damnation. You have not had a good Catholic education. I was taught, over 50 years ago, that good people can go to heaven, even outside the church. No reasonable person would believe that the billions who never heard of Jesus went to hell because of that. That's esp true, as one writer said above, of those in the Gospels Jesus spoke of from the Old Testament who were in heaven. By the time we stand in the presence of God following death, atheism and the conglomerate of all religious affiliations searching for Truth, that is for Christ, often without knowing it, vaporizes. We are now ready to Believe. Scripture says God wishes that ALL be saved. The choice made Glory happens, or "Everlasting Death," the term Jesus used to explain Hell. Goodness of Will is the key that opens heaven and the little boy Emanuel's Dad saw God and Believed. Pope Francis was pastorally right assuring the child that his Dad was in heaven. Trust In Jesus assures that. It looks as if the religious will indoctrinate by any means necessary. This was always my take on "judge not...". NONE of us can say who does or doesn't go to Heaven. Heck, we really can't say what heaven is. But Pope Francis showed a kind and wise response which was Scripturally sound and in keeping with Christ to a huge degree. Very well done indeed! Nothing about assent to Christian dogma here. Of course he was right. Yes one gets to the Father through Jesus Christ. How that occurs does not necessarily mean by becoming a professed Christian. For non professed Christians one's encounter with Jesus can occur outside the Church. In striving to be a good person , a humanistic person one can say yes to Jesus.Even professed Christians who merely say Lord, Lord, but are lacking in humanistic ethics are not, Jesus tells us, pleasing to God. Our faith is a gift to us, the church is a gift to the world, an expression and manifestation of God's eternal saving love for humanity, but those lacking the gift of Christian faith, of being members of the Church [on earth]are no less saved by Jesus Christ's incarnation, death and resurrection. God loves the world, God loves humanity and Jesus's' saving grace is for all humanity. Whether they know this or not ,whether they believe it or not. One is not responsible for ones sincere beliefs. A non professed Christian may be a crypto Christian; known to God only and a member therefore of the heavenly Church. The earthly institution consists of only professed baptized Christian but the heavenly church contains all who God wants. [ That may be all humans, after time in purgatory]. That 's Christian theology. On a purely Christological? level, Jesus Christ admonished those who would harm a child; "better a millstone be put around their necks...".How harmful is it to tell a child that sorry, but the dad you loved is damned to hell! "The words 'Which Faith except every one do keep whole and undefiled, without doubt he shall perish everlastingly' are the offence. They are commonly misunderstood. The operative word is KEEP; not ACQUIRE, nor even BELIEVE, but KEEP. The author, in fact, is not talking about unbelievers, but about deserters, not about those who have never heard of Christ, nor even those who have misunderstood and refused to accept Him, but of those who having really understood and really believed, then allow themselves, under the sway of sloth or of fashion or any other invited confusion to be drawn away into sub-Christian modes of thought. They are a warning against the curious modern assumption that all changes of belief, however brought about, are necessarily exempt from blame." I (an old man, now) was brought up in days long before Vatican II/Paul VI. The Church's teaching in those days (however much anyone might want to airbrush this fact away now) was that anyone who is not a Roman Catholic or in communion with Rome has no hope of salvation; that 'extra ecclesiam nulla salus', and that, no, it does NOT all depend on what you mean by 'ecclesia.' Quite early in my adult life I came to think this a cruel and ferocious doctrine; but it's certainly what the Church taught - and the Church doesn't teach it any longer. So, problem - the Church either taught error in the past, or teaches it now; and so bang goes the idea of an infallible magisterium. I resolve the problem by telling myself that the Holy Spirit is active in the Church, and in the world. So the Church is progressing to a fuller understanding of ethical, divine truths. Not until the second coming of Jesus Christ , will we have complete truth, but we are progressing ethically in the church, and in some ways in world. [ that's a mixed bag]. So as morally reprehensible and as shocking as it is from todays sensibilities , to know that the Catholic Church, founded by Jesus Christ, once taught that only Roman Catholics could go to heaven, that we no longer hold such an inhumane and unchristian belief, that we are ethically repelled by this theological claim, shows God at work in the church. The church on earth is comprised of fallible, sinful ,cable of error , and cable of evil, humans , but God is at work perfecting and correcting the Church. That the church is cable of such evil and sinful theology and ethics, should make us humble as Catholics, because though the church contains the fullest truth of God's revelation[ we are not the sole posessers of divine truths as all other religions contain SOME truths about God too, and non believers can know divine ethical truths; for "Gods laws are written in our hearts"] it does not follow that we as Catholics/as Christians are better as a church and as human beings, then non Christian/Catholics. Infallibility is contained in the salvation narrative found in the Apostle's creed[imo]. "This affirmation is not aimed at those who, through no fault of their own, do not know Christ and his Church: Those who, through no fault of their own, do not know the Gospel of Christ or his Church, but who nevertheless seek God with a sincere heart, and, moved by grace, try in their actions to do his will as they know it through the dictates of their conscience - those too may achieve eternal salvation." "Although in ways known to himself God can lead those who, through no fault of their own, are ignorant of the Gospel, to that faith without which it is impossible to please him, the Church still has the obligation and also the sacred right to evangelize all men." Do you think Jesus Christ spoke English, Mr. O'Leary? Apparently you have little interest in philology, but "philology" is a very important part of Biblical exegesis. The preposition "through" has a translation in a number of other languages that is quite different from its English meaning. The Jesuit Anthony De Mello was quite perplexed by this phrase, wondering, if I remember the story accurately, whether "through's" meaning encompassed the biological meaning--as if, literally, through the eating and drinking of the Eucharist, and being, thus, physically incorporated into the "true Body"--or whether it had to do with a fiduciary, that is, a legal relationship, similar to writing a "power of attorney" letter. Then, as I have heard it, he went to researching the meaning of the phrase in Aramaic, and discovered that that English preposition has no exact equivalent in the ancient language. Do you know what translation De Mello supposedly hit upon? It's "No one comes to the Father but by BEING ME." It seems to me that that mystical-sounding formula resonates much more accurately with the whole of the Savior's teaching in the Synoptic and Johannine Gospels--that no one "comes to Father" except by a complete oblation of self, an entire extinguishing of the ego through prayer and meditation, and thus by a spiritual uniting with the will of God. And THAT may be accomplished along many different spiritual paths, and, perhaps, by no spiritual path whatever, but through the immense compassion "for all sentient" beings which Buddhism enjoins. I know, you'll say I'm a "universalist," but I think it's toward that kind of "universalism" that the most enlightened strands of all the world's great religions are tending, and I also believe that Jesus Christ has no problem whatsoever with that kind of "ecumenism." "Just love, and then do as you will" and "Put on Christ," and forget about "catechisms." Possibly when THAT happens, the Jews will be able to recognize Christ as their true "Messiah"--as the perfecter of the Torah! Modern Aramaic, or Biblical era Aramaic? What about biblical era Hebrew, the theological language of the day, or Koin Greek the original language it was all written down in? I think you are pushing it a bit far.
" Jesus Christ the Nazorean whom you crucified...There is no salvation through anyone else, nor is there any other name under heaven given to the human race by which we are to be saved." I'm not attempting to "reverse" them; I'm attempting to broaden them, and I'd never question the supernatural uniqueness of the "Jesus phenomenon." I just agree with Vatican II that there is such a thing as "implied faith," and that one need not utter than "name" in order to be "saved" by it. I have not ever been able to accept, and I WILL NOT accept that the virtuous pagans, atheists, Buddhists and Jews cannot go to "Heaven." No one knows "rationally" (i.e. scientifically) where one "goes" after death. One may only TRUST in the words of the Word, and in Providence. Claims to ownership of the afterlife by religious sects has been the chief reason why so many insist in this current epoch that "religion" has been the chief incitement for most of history's blood-letting. I will not let my version of Catholicism be a part of that story, and my conscience (the "primal voice of God in man," as Newman calls it) tells me I must not let it be. Robert - With respect to your "version of Catholicism", you doth protest too much. I suggest you read Dominus Iesus, or even just the wikipedia article on it. Both I, in my comment above, and the Catholic Church, and this document, and St. JP II shortly after this document, say that people outside the Church can be saved, but salvation can only be through Jesus and His Mystical body, the Church, not some non-divine, human guru who spouts sentimental words or contradicts Jesus. St. JP II, (on 6-12-2000) in a statement emphasized further that the Church continued in the position of Vatican II that salvation was available to believers of other faiths: "Those who have chosen the way of the Gospel Beatitudes and live as "the poor in spirit", detached from material goods, in order to raise up the lowly of the earth from the dust of their humiliation, will enter the kingdom of God." Rev. John G. Panagiotou, chancellor of the Greek Orthodox Diocese of Pittsburgh, said at the time: 'I think the media has taken a big spin on this and made it a polemic instead of explaining what the document really says." And just when did the magisterium start encrusting the church with its laws and judgments? Probably when it became an accepted religion by the Roman state and many holy people took to the desert in order to maintain their meditative focus, their glimpses of the beatific vision. I think I have my time frame correct: the Benedictines have been around longer than the Vatican. And they are humbly subservient to the Vatican but several times each day maintain their meditative focus, similar to that of the desert mothers and fathers who left Rome way back when. I tried to leave this comment after Robert Lewis' comment in which he mentioned Anthony de Mello, where it might be a bit more appropriate. but never mind. Anthony De Mello means well but it is not up to him to change the meaning of words. Buddhism has immense compasson for all sentient beings - what type of Buddhism are you speaking of. Too much sophomoric flapdoodle going on here. I am literate in several languages, especially with the help of high end translation AI. (How's your Elvish? Mine's fine) All of your are correct to assert that one can read precious little through multiple translations let alone multiple translations over multiple centuries. And that does not include outliers like Sanskrit, or, god help me, Chinese. One of the first things I learned in multiple translation is that you can't translate until you can convert one language's metaphor into at least your own. Poetry is even more difficult. Don't parse words. Discern intent. That's why dogs are literate in multiple languages. This look for intent, purpose, inner meaning. The fact that they can't talk is irrelevant. Until you figure out that your dog is a better linguist than you will ever be you are just kidding yourself about your magnificent translations. Me too, of course. I am 70 yrs old. I went to Sunday School so long ago it was called Sunday School, not CCD. We were taught that the good could go to heaven even if they were not Catholic. Middle age guy here. The Jesuits taught me that, "through me" meant that God is good and goodness is diffusive of itself (St. Thos. Aquinas, right?). The "through" was more of an instruction to Jesus's followers to make him known in all things so that "the good" could be experienced and practiced by all throughout the world. Not that, literally, the unbaptized had not chance of salvation. The Sermon on the Mount, remember? Several translations use "through me" (eg. NIV). KJV and Douay-Rheims use "except by me." St. Jerome's Vulgate uses "misi per me." St. Thomas wrote a lot on this, here (https://dhspriory.org/thomas/english/John14.htm). He distinguishes the journey (the Savior Christ is the way) and the destination (the divine Father and Son, "who are one"). Fuller quote below. Catholic self-understanding is explicit: anyone who is saved, can only be saved by Christ (and the Church is His mystical body). There is no other Savior for all of humanity, all of creation. “Therefore, no one can acquire a knowledge of the Father except by his Word, which is his Son: "No one knows the Father except the Son" (Mt 11:27). And just like one of us who wants to be known by others by revealing to them the words in his heart, clothes these words with letters or sounds, so God, wanting to be known by us, takes his Word, conceived from eternity, and clothes it with flesh in time. And so no one can arrive at a knowledge of the Father except through the Son. Thus he says: "I am the door; if any one enters by me, he will be saved" (10:9). Note, with Chrysostom, that our Lord had said: "No one can come to me unless the Father who sent me draws him" (6:44). But here he says: no one comes to the Father, but by me. This indicates that the Son is equal to the Father." I remember it too. I was in Catholic grade school and I thought it was mean and worse yet, stupid. Of course, I was right. Kids don't tolerate stupid even today. Was the Holy Father right? The mystery of God's Mercy and Justice say yes he was. Who can measure God's mercy so as to limit it, and who has the wisdom beyond the Lord's to judge more fairly? I remember the minor furor when the Pope, while talking to Jews offered them hope for salvation. My good friend and coworker, a Jehovah Witness, pointed me at that time to so many well known and clear passages to prove Pope Francis wrong, Yet I knew and believed in the man who understands the ways of Holy Trinity more so that I ever will, at least until salvation come when all of will know. And in the Pope's compassion to a grieving child of God, he offered what Christ offered, "Let not your heart be troubled". If only we had the faith of children Christ desired us to have. And this small child showed us what a Catholic ought to be, running to the arms of the Holy Father seeking mercy and justice. Seek and ye shall find. The baby sought and he found. It seems to me that everyone commenting here is being a little judgmental - assuming that they get to judge on Emanuele's father place in the afterlife. I can certainly understand the Holy Father's most human desire to comfort the child and I would have wanted to do the same thing. But, I do think he could have used this moment to teach a little more deeply than he did. I liked that he said that we do not get to judge who is in heaven (in either direction) and that it is up to our Father in heaven. The Church gets to canonize saints only after a sign from God (the miracles). I would have preferred if he hadn't used the phrase of God possibly abandoning his children. My understanding of our Catholic faith is that God doesn't abandon any of his children. It is only the children who might abandon God. Yes, if you read the way he said it. If the boy had said his father was a monster than it would be different. Can hardly believe that this question is being asked ! Living the Beatitudes as best we can...helps us to "see" with different eyes. The Way has been given to us to model. It is our level of awareness, empathy and volition which can bring us to living the Example. I've never been an atheist, but I would describe my position as being one who seriously doubted God's existence for several years of more despite having been raised by a devout Catholic father (who was taught by pre-Vatican 2 teachers) and a devout Protestant mother who was raised as a fundamentalist Protestant but became a mainline Methodist after she was told by her pastor that she couldn't receive Communion if she married a Catholic, my father. She did so, (,and I apologize for the lengthy, perhaps confusing remarks) became a United Methodist but agreed to my siblings and me being raised as Catholics and attending Catholic schools while practicing her faith. (When I was about 9 years old, displeased that we weren't worshipping as a family, my Mom began to attend Mass on most Sundays without converting. She did convert when I was about 15 years old. Ironically, the priest who instructed my Mom in the faith had been raised as a fundamentalist Protestant, too). Also, my Mom didn't believe that non-Christians and non-,believers could go to heaven, but my Dad told me and my two siblings that it was possible for those who never heard of Jesus but were morally good people to go to heaven. I attended Catholic schools through college (from 1968-1989, when I graduated from college--I took a break from attending school by working for 4 years). My religious education may have been uneven in the sense that my teachers were all raised in the pre-Vatican 2 era, but taught us a mixture of pre-Vatican 2 and Vatican 2_teachings. Perhaps this was why I was taught that while the Catholic Church was the surest path to heaven, that good people who sincerely sought God could go to heaven. No mention was made of atheists, however, as I recall. Long (!) story short (?) for personal reasons I became what I considered to be a Catholic agnostic for several years. Although I seriously doubted God's existence, and ceased attending Mass except on major holydays, I tried my best to follow the teachings of Jesus (as taught by the Church) in my everyday life. As an imperfect Catholic, I believe that the Catholic Church is the surest path to achieving eternal life (,heaven) but that those who live good lives, including non-believers, can go to heaven. I'm sorry Tim, but according to the Bible, good people don't go to heaven, only perfect people. And the only one who was perfect was the sinless One, Jesus. The Bible is very clear on the need for substitutionary atonement for the covering/cleansing of sins, both in the Old Testament and New. If your trust is in anything other than the sinless blood of the Lamb (Jesus) you have no covering for your sins and cannot be with God. Read about the Passover in Exodus 12. Death was visiting Egypt and the only way God's people could be saved was to literally paint the blood of an innocent ("sinless") lamb over the door frame of their house. If they didn't put their trust in God's promise to "pass over" them if they covered their door with blood, they would experience the death of their first born. In the same way they looked to God to see the blood and "pass over", we look to the blood of Christ to cover us and be considered/counted righteous. In the Old Testament they got glimpses of God making atonement of sins through the blood of a lamb and looked forward to a day when God would make a sacrifice once and for all, we look back and know Him by name, Jesus. I also recommend reading Romans 4:13-25 where Paul talks about Abraham's faith being "credited" or counted to him as righteousness. It's the same for us. By faith, Christ's righteousness is credited to us through the shedding of his blood. It's all quite amazing (I think) to see the dots connected from Old Testament to new. Anyway, I hope this message finds you well and I don't mean any ill will. I think this is clearly what the Bible teaches and would be doing you a disservice if I didn't point it out. I agree optics of "pope" and little boy is a tear jerker for sure and it makes everyone feel warm and fuzzy. Jesus said Satan was the Prince of the World and how interesting the "world" absolutely loves bergoglio - because he is everything to everyone. He says what you want to hear and implies that you don't have to follow anyone (including Jesus) to be rewarded. This is simply a lie. Lets put aside the emotion and consider logic. Everyone agrees God determines who enters Heaven. But there is a danger today in this Universalism thought process. It is false. Contrary to God's justice and is not logical. Consider this for a moment - if EVERYONE who is born is going to HEAVEN no matter what they believe and what religion they profess then that makes an absolute mockery of Our Lord Jesus Christ. Why did Jesus need to come at all? Why did He need to suffer a most excruciating death? If EVERYONE is saved from birth no matter how many sins they commit - then Jesus didn't need to come and die. God could have very well just given everyone a free pass to heaven upon birth. Take it a step further, whey be born into the world at all? Why not just be born straight into Heaven? But if you are intellectually honest, you will agree this is not logical and it contradicts Jesus own words. Almighty God gave us His only begotten Son as a sacrifice so that THOSE THAT FOLLOW HIM may have eternal life with HIM. Jesus came to show us how to find the "narrow gate" that leads to Heaven and everlasting life. Jesus Himself said very few find it. Mathew 7:13 "Enter ye in at the narrow gate: for wide is the gate, and broad is the way that leadeth to destruction, and many there are who go in thereat." Think about those words from Our Lord. He is warning EVERYONE that wide is the gate and broad is the way that leadeth to destruction (that lead to the 2nd death - eternal punishment in hell) and MANY there are who go in thereat. Jesus own words saying there are those who go to hell and are destroyed. Jesus said it all and there really isn't anything to add to it. Jesus came to build HIS Church. That Church is the Holy Catholic Church. There is only 1. Luther and PROTESTant revolt caused a runaway train of "man made" versions of Jesus 1 true Church. Today there are tens of thousand of "Christian" churches. Just think about that? It can't be true that all of those are Jesus Church. The fact is they are a lie. There is only 1 true Church and it is this Church that Jesus gave the Keys to His Kingdom. It is to this Church that He gave the power to forgive sin. It is to this Church He gave the command to go out and teach the world the truth. The Catechism and Laws of the true Catholic Church (not false vatican II imposter) are the guidelines for eternal life. The entire world is terrified of true Catholic catechism - which is the PATH Jesus left us - because they know they don't follow it. But rather than change their hearts and minds, repent and discipline themselves and follow the Law set out by Our Lord Jesus, most prefer to dismiss the laws of the true Catholic church, (reject Jesus Christ) and like the anti-pope bergoglio, believe the easy-peesy, feel good, I'm-a-good-person, everyone going to heaven kool aid poison. I write this today because I urge you not to be deceived. Do not fool yourself. Yes Almighty God is Most Merciful and Yes ultimately God can have Mercy on anyone and accept them into Heaven. But don't be guilty of the Sin of Presumption that you don't even have to believe or do anything and you are guaranteed a seat next to St Peter. Because this is a lie of Satan. We have no understanding of the Justice of Almighty God. The Justice of God is terrifying and it requires sacrifice and satisfaction for sin. Read the lives of true Catholic Saints and you will find all of them had one thing in common - they were terrified of the Justice of Almighty God. The closer they came to God in prayer and mortification, the more visible their defects and the Justice of God and that terrified them. If you doubt God's Justice consider that Jesus implored His Loving Father to take the cup from Him. Jesus prayed to His Father to save Him. So exact is God's Justice that His only Son had to make the sacrifice and die for satisfaction of sin. So consider the state of your soul in light of that Justice because that is the Holy Justice that you will face when you die. Anti-Catholic bigotry is fun for many, but the most fun is Catholic anti-Catholic bigotry. Bigoted Catholics, sometimes possibly including prominent prelates at the highest level, love to trade in caricatures of both attitudes and in popular misrepresentations of Catholic doctrine. Whenever a Catholic brings up the word “rules,” for example, in reference to Catholic thought, you know you are dealing with a Catholic anti-Catholic bigot. Since Catholic anti-Catholic bigots are so numerous, it’s hard for Catholic anti-Catholic bigots to even consider the reality of Catholic anti-Catholic bigotry, but it does exist. If Catholic anti-Catholic bigotry were not so pervasive and so enjoyable to so many Catholics, especially when they can pridefully pat themselves on the back for being exceptionally loving, no one would be discussing something the Catholic religion has never taught. It has never taught that non-Catholics or non-believers can not go to heaven. It has always recognized the internal forum that Christ spoke about referring to Our Father knowing all the intentions of the heart. Wow. When facing an extremely emotional and difficult issue with a little sad boy, Pope Francis doesn't put limits on God, lets God make the decisions. No position taken. But when it comes to so many other topics where suffering, such as permitting women into the clergy, gender reassignment, family planning, assisted suicide, euthanasia and so on...things are very unambiguous and clear, the limits are undoubtedly placed on the word of God's, as the Pope's decision quite often does. Don't get me wrong, telling the boy there is a chance his father isn't burning in God's eternal torture chamber was a good move...but it is far fetched to claim he did this because he wants to leave answers up to God. Francis frequently does the opposite. No one can dispute the Holy Father's gift for consoling and warming the hearts of those who suffer. But in doing so, it seems hard to believe that this boy's question was not somehow leveraged to promote the notion that even atheists can go to heaven without the grace of final penitence because they were good, or in this case, had their children baptized. It would have been one thing if the Holy Father had told Emanuele that he could have hope for his father, despite his apparent lack of faith, because God reads every heart and no one but He can know the final disposition of a soul, which is able to convert even at the moment of death in response to God’s grace. But it was quite another thing, to propose in a public setting and with cameras rolling, the notion of the universal salvation of all “good people” even if, as was the case with Emanuele’s father, they “did not have the gift of faith” but were “good people”. This question strikes at the heart of the Catholic faith revealed by God Himself (John 3:18) -- let alone the Catechism, and is one that would have been better addressed in private with the boy at another time, taking care not to mislead the faithful while consoling the boy in his grief. To advocate otherwise as this article suggests, leads one to believe that God can operate against His revealed word (Mark 10:18) by saying that you only have to be "good" to get to heaven. This is not a case of a good person suffering from invincible ignorance, but of one who denied God's existence -- something that the scriptures tells us even the pagans have written on their hearts (Romans 1:19). Yet the Holy Father points to heaven and tells the boy to pray to his dad -- something left to God alone to know with certainty. This has the potential side effect of telling any atheist moved by this scene to carry on and be good. Again, he wants to console this poor child who misses his father, no one disputes that. But the infused virtue of hope tells us to entrust that to God's mercy and providence and not write him a ticket to heaven. Further, what are we to make of this remark by the Holy Father? "Here, Emanuele, this is the answer. God surely was proud of your father, because it is easier to be a believer, to baptize children, than to baptize them as unbelievers. Surely this is so pleasing to God. Talk to your dad [pointing upward to heaven], pray to your dad. Thanks Emanuele for your courage." So are we to believe it is more meritorious in God's eyes that a non-believer should baptize his child than a believer? What does that say to believing fathers? Presumably, a devoted believer would also study, practice, and live out his faith and transmit it faithfully to his child -- something an atheist would be at odds to do. Regardless, this is an unusual conclusion to draw in front of the cameras. I hope Emanuele's father had the grace of final penitence, and that one day they will be reunited in heaven. In the meantime, we can all pray for his soul and all those in purgatory now entrusted to God alone. Charity moves us to hope and pray that no one would be lost, but we also know that even Jesus did not teach this. Let us also pray that Emmanuele himself will not grow up to be just a "good atheist". At a moment like that what can a person do except show mercy which Pope Francis did. Most assuredly this was a moment for a pastoral answer not a theological-dogmatic response. Then he could have said something along these lines. "Emmanuele, I am so sorry that your father has died and how much you must miss him. I know how hard that must be for you." Let's pray together that God, who is all good, gave your father the graces he needed to be sorry for his sins and to believe in Him before he left us on this earth. Pray always and never forget to trust in God's mercy. Let's us all pray for Emmanuele's father and for all our beloved dead in purgatory. May all the souls of the faithfully departed in the mercy of God rest in peace and let perpetual light shine upon them. Amen. God bless you Emmanuele and be a good boy and help to your mother and family." And this he could have completely said privately even with the cameras rolling and not shared with everyone. That would have been really pastoral. Instead he turned it into a public teaching moment for everyone with the concerns I have expressed in my comments above. It seems, the Author@the pope himself do not know God personally only from a ...school(also St.Ignatian's Exercises)@never experienced Him spiritually: his pro or contra direct "words" in the heart! A (theoretical)way to heaven is simple: only through the cross (1Cor 1:8! Does an atheist can do it? I doubt though in theory it is possible after a conversion (like R.Hoes,the Commander of Auschwitz; have you heard of other Tyrans? Where are they then? Hell-ooo! We do not know? More,to make a decision one has to have at least the basic knowledge of Bible@philosophy in order to be fooled even by a... Pope, especially this one whose actions (words@deeds) are of Matthew 5:37,i.e.contra Jesus' warnings@divine St.Aristotle's non-contradiction principle. 1P4:17- also confirms it; now, we People have all resorces to know finally the absolute truth contrary ot our fahters@mothers who did not even had the opportunity to finish a school (of WWII)and still this ape-genration wanders in ...intellectual and moral darkness except Individuals called in Bible the Rest (a tiny % of popualtion. I do not theoretize: recently, some Graduates felt when I said TV is from half-idiots for idiots!! They felt "insulted"-no more a friendship. Jack Bentz, S.J., lives in San Jose and works with the Jesuit Conference.